The NY Times has a brilliant article about Microsoft which is probably the best resume for their future and current strategy. We’ve seen Microsoft acting weird under Ballmer command – too much suits, politics and bullying everyone. Those were in fact the worst times in Microsoft history and when Ballmer left, stocks gone up. But now we can see a clear “mobile first, cloud first” strategy with Nadella. In fact I find this whole Microsoft strategy brilliant! They’ve positioned themselves again as a software company and finally embraced the “multi-platform” into their own garden. Last Windows 10 release with support for Android and iOS apps, open sourcing .NET, multi-platform Visual Studio and some recent developments for Azure, made me thing that they’re in fact the underdog here with a lot of – again – potential. For those who follow me on Twitter, might know already that I was at Microsoft HQ recently. And what I’ve seen was a completely new Microsoft. More open, more focused and keen to work with everyone. Now, if that is going to be translated into real things is something we’re going to find out soon, but it was the first time in years that I actually liked Microsoft. And bare with me, I’m not a Microsoft fanboy. Actually the opposite! But this recent change and strategy made me thing otherwise. 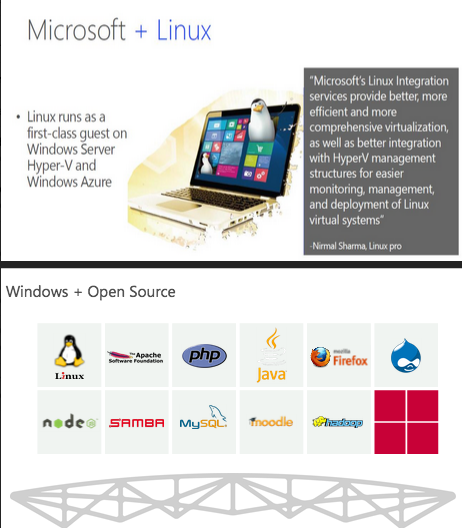 In fact when you get this from an internal presentation at Microsoft, you know that 1) things are changing for better, 2) makes you believe into a new future. Thumbs up!